Dangit! That's two weeks in a row you've done debrief episodes for games I haven't played yet. I'm going through serious EXP withdrawals here...at least I've got some videos to keep me going! We're always very sensitive with spoilers during debrief, so you're welcome to listen until we reach spoiler territory. If you're especially sensitive though, I highly recommend you check the game out. It's well worth it! Hi there thank for the sharing about brothers. I agree that this game is a story driven game and i very enjoy in the games not only the story and also the atmosphere, art style, game play and many more. This is my first time to play this kind of game and the game really grape my attention until i can't stop playing it until i finish the whole game. The game mechanics in the game is very interesting because you are using two character to helping each other to solve the puzzle and reach your objective. Another thing is you can interact something inside the game and the older and young brother will give different result on how they interact, this is the good way to show the characteristic of the character in the game and this also make the game more interesting because different character have different ability to do something and you have to use both of the character to achieve your goal. The game level also well design as you progress more and more and the new game mechanic and move is add inside the game. The game mechanic i enjoy the most is when the brothers using the goat to jump up to the hill, they using the robe to tie them together to progress to their goal and also the time when the brother work together to fight the spider because of this i can't stop playing the game because more and more things are attract me to continue to play it until i finish the whole game. The story is also very good by using the hero journey structure because their goal is clear and the story driven is very strong. 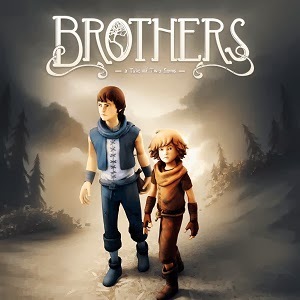 The interesting of the story in the game you can see how the brothers growth in their adventure and mostly about the younger brother when the older brother not able to continue the journey with the younger brothers, you can see how the younger brother growth because he has to face all the problem and solve it by himself to reach back to his father with the potion. The atmosphere of the game also very well with the music and the art style of the game. The music in the game give me a feeling of tension and driven me hardly to finish the game and the game also give some kind of fear and dark feeling because of the colour in the game and also you can see some dark element in the game when you progress more and more far. I hope there is more and more kind of game like this to play because i really enjoy the game and the game not so long to finish it. This is my gaming experience about the brother and i will like to share it. Please don't be offence of my sharing if you feel i did some spoil to you thanks.